Modcloth has the cutest educational shot glasses! 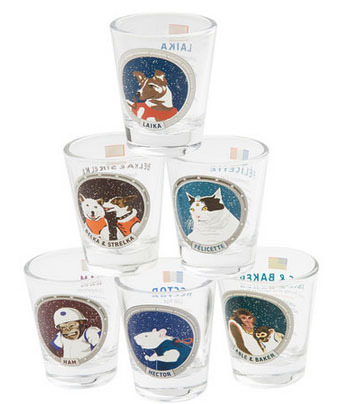 It’s a set of six shot glasses, each one features animals that have launched into space. The design of the graphics are reminiscent of classic commemorative glasses, like these glasses for the Apollo missions (I have the whole set, including the pitcher). These shot glasses are incredibly fun; I absolutely love the drawing of Hector the lab rat! I am not a big drinker, especially of liquor, but I still plan on buying these. Maybe I will use them as decorations, or for tiny shots of orange juice! The best thing about these glasses are the facts on the back! You learn the launch date, the spacecraft the animals traveled on, and a few other fun and interesting facts. This is great since most people are aware that chimpanzees and dogs have been in space, but not everyone knows much about Hector or Félicette! However…. 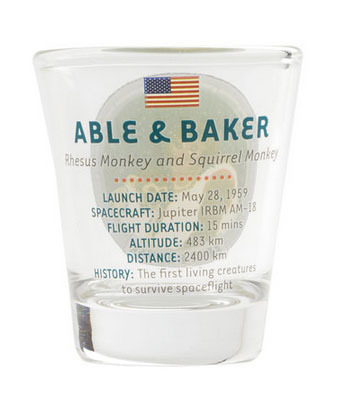 I have to make a correction to the shot glass of Able and Baker; they were not the first living creatures to survive spaceflight. Fruit flies were launched into space on a V-2 Rocket in 1947 and they were recovered alive, making fruit flies the first creatures to survive spaceflight! But Able and Baker were the first Mammals to survive spaceflight! If you want to know more about animals in space, there is a nice comprehensive poster in this article on Space.com. It is a great read, especially if you want to learn more about how we have make human spaceflight possible! 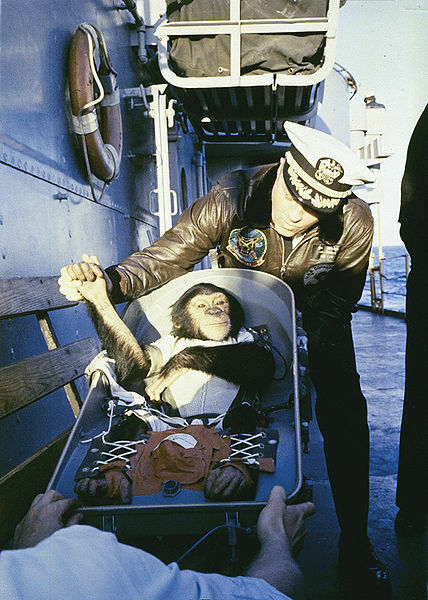 I will leave you with an adorable picture of Ham the chimpanzee receiving a handshake when returning back to Earth after his flight on the Mercury-Redstone 2 in 1961. He looks so pleased with himself, and he should be! I love those shot glasses!